One of the things I love most about the Bible is the way it all fits together. Sometimes the same thing pops up at vital parts of the story, like the tree of life in Genesis 2:9. It’s there again after the fall, this time barred from Adam and Eve because of the curse (Genesis 3:22). Yet then it reappears in heaven (Revelation 2:7), with an invitation to eat its fruit. In between, you have another tree, we call it the tree of death. On that tree the curse was reversed, as our access to the tree of life was won by Jesus Christ (see Galatians 3:13). Trees are more important than you think! Biblical themes often appear insignificant until examined closely. Take something as simple as linen. All four gospel writers go out of their way to emphasise that Jesus was buried in a linen shroud (between them, they mention it nine times). It’s emphasised because linen has a special place in the Old Testament. It’s a symbol of wealth and power (Joseph and Mordecai were honoured with linen, Genesis 41:42, Esther 8:15). It’s also a priestly garment (Exodus 28–29), so that on the Day of Atonement (Leviticus 16), ordinary priestly garments are replaced — the high priest’s tunic, undergarments, turban and even the sash are all made from ‘sacred linen’. In fact, the tabernacle itself, where God was said to dwell, was clothed in linen (Exodus 25–28, 35–38). All this means that linen reminds biblical readers of power, priests, and God’s presence. What more appropriate material could there be in which to bury the King of Kings, the Great High Priest, and God’s Son on earth? Remember too that in heaven the church will be given “fine linen, bright and clean” (Revelation 19:5). We will be able to wear our linen, only because Christ ‘wore’ his linen. I love that sort of thing. It’s one of the many qualities of the Bible that convinces me of its divine origin. Christ in all the Scriptures? On the east, toward the sunrise, the divisions of the camp of Judah are to encamp under their standard. The leader of the people of Judah is Nahshon son of Amminadab. His division numbers 74,600. The tribe of Issachar will camp next to them. The leader of the people of Issachar is Nethanel son of Zuar. His division numbers 54,400. The tribe of Zebulun will be next. The leader of the people of Zebulun is Eliab son of Helon. His division numbers 57,400. All the men assigned to the camp of Judah, according to their divisions, number 186,400. They will set out first. And so it goes on. That’s just a small fraction. I believe that Christ is in all the Scriptures, but where is he in all of that? Thankfully, help was at hand in the shape of Iain Duguid’s wonderful commentary on Numbers. With his help, I looked more closely at the chapter, and even sketched a little plan of the layout. Immediately we can see something important. God is right in the midst of his people, ‘tabernacling’ among them — just as Jesus did in John 1. Where is Christ in Numbers 2? Right there in the middle! But wait. Look at that image again. Do you notice the ring around the tabernacle, protecting it? Those are the priests and the Levites. Numbers tells us why they’re there: “The Levites… are to set up their tents around the tabernacle of the covenant law so that my wrath will not fall on the Israelite community… Anyone else who approaches it is to be put to death.” (Numbers 1:53, 51). God is in the midst of his people, but he is also separated from them. The Levites and the priests are acting as a barrier between God and his people — ensuring that God’s wrath doesn’t break out on the sinful Israelites. So what’s special about the Levites? According to Numbers 3, they belong to God, because all the firstborn belong to him, and God had taken the Levites in place of Israel’s firstborn. Each Levite redeemed one firstborn son. That’s why the counting was so important, to make sure all the firstborn had been redeemed. So when we look again at that inner ring of tents, we see there the firstborn of God, who offer sacrifice in God’s presence so that his wrath does not fall on his people. Christ is not just represented by the tabernacle, he’s represented by the priests and the Levites too! Now take a look at the outer ring of tents. The prime position is in the east (where the sun rises, and where the entrance to the tabernacle is), where Judah is camped (2:9). But shouldn’t Reuben, the firstborn, be in the prime position? 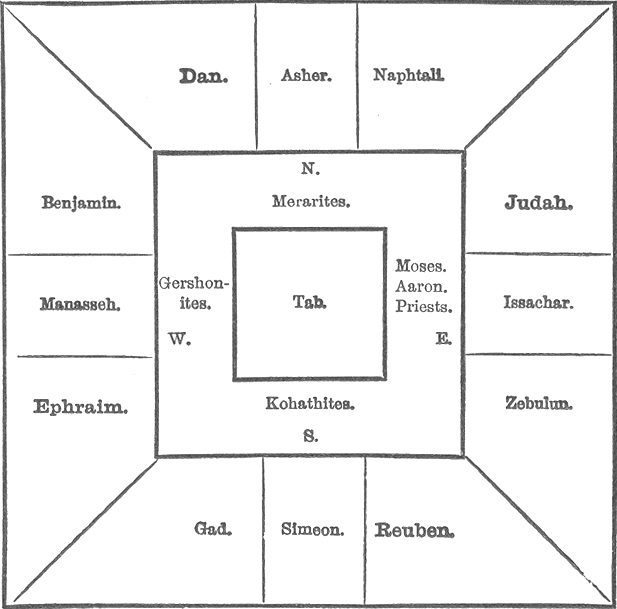 The two lists of tribes in the previous chapter both have Reuben first. So why in the camp is he relegated down the list? Genesis 49:3–4 gives the answer. Reuben slept with his father’s concubine, and as punishment for his sin, he lost his pre-eminence. Simeon too was overlooked — with Levi he killed many men in anger (Genesis 34, 49:5–7). Judah, the third son, was hardly a model of godly character, either. He slept with his daughter-in-law, thinking she was a prostitute (Genesis 37). Nonetheless, it was Judah who offered himself as a substitute when Benjamin was condemned in Egypt. That led Jacob to prophesy that Judah would be a lion, holding a sceptre and a ruler’s staff (Genesis 49:8–12). The ordering of the tribes is important, because through Reuben and Judah it points us to Christ. Reuben’s failure as a firstborn is part of a biblical catalogue of similar failures, of which Cain and Esau are the most prominent. If Israel was looking for a firstborn to save them, the firstborns consistently let them down. To underline the point, the “saviours” Israel did have were often the youngest brother (Joseph, Moses, Gideon, and of course, David). Despite the hope invested in them, firstborns invariably failed. Reuben shows our need of a greater firstborn who would not fail (Romans 8:29, Colossians 1:15, Hebrews 1:6). Similarly, Judah’s substitution for the condemned Benjamin points to Christ, too. He took our punishment, and stood in our place. It’s no surprise to find that Jesus was part of the tribe of Judah (Matthew 1:2), that Bethlehem was part of Judah’s territory (Matthew 2:6), and that he is the true Lion of Judah (Revelation 5:5). I’m glad my upcoming sermon forced me to not simply skip the long lists of names and numbers. Without it, I would have missed being reminded that Christ tabernacles amongst his people, that as our Great High Priest he shelters us from God’s wrath, that as the true firstborn he has received God’s blessing and accomplished what all those before him failed to do, and that as the Lion of Judah he was our true substitute, saving us from condemnation. This article was published in March 2017. Bookmark the permalink.